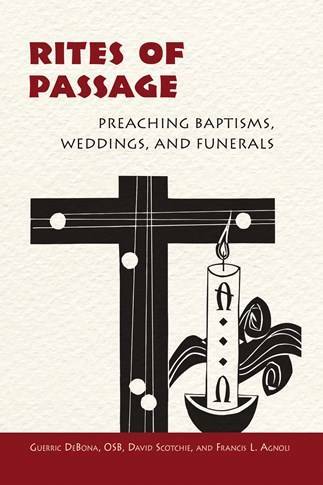 Rites of Passage is a much-needed, practical homiletic resource for priests and deacons who preach Christian baptisms, weddings, and funerals. The three authors, a religious priest, a diocesan priest, and a permanent deacon, draw from the scriptural and liturgical resources available to the preacher for these three important ritual moments to suggest ways to build an effective homily. This book will serve as a helpful and engaging resource for priests and deacons in parish life and as a blessing to the faithful. Deacon Francis L. Agnoli is Director of Liturgy and Director of Deacon Formation for the Diocese of Davenport. Rev. David Scotchie is pastor at the Most Precious Blood Catholic Church in Oviedo, Florida. There are few texts for preaching in the contexts of baptisms, weddings, and funerals, and rarely are they combined in a single volume. This is a unique and comprehensive text-nothing of its kind exists-an outstanding work; a work that is long overdue, and one that is desperately needed. This is not just a text, albeit it is an excellent one that must find its way into the seminary classroom and formation programs for permanent deacons, but it is also a superb manual, reference, and working guide that will be marked-up, dog-eared, and highlighted by its every reader. DeBona, Schotchie, and Agnoli are providing an essential tool for all of us who preside, officiate, and minister at baptisms, weddings, and funerals. Bravo! Given the 2016 Order of Celebrating Matrimony 2nd Edition changes to the 1969 1st Edition, Rites of Passage: Preaching Baptisms, Weddings, and Funerals provides a clear guide for new preachers and creative insights for the more experienced among us. Utilizing the proven strategy of connecting the Bible and the Liturgy to create a unique preaching for a particular assembly, this work approaches these rites with a variety of practical lens by which the preacher can create memorable and meaningful encounters with Jesus Christ. A true help for the busy priest or deacon, Rites of Passage will amplify the preacher's ability to deliver impactful homilies that will move people. Even the greatest Sunday preachers don't do their best work at baptisms, wedding and funerals. A busy priest or deacon may lightly doctor an old homily from similar circumstances and reframe it. Rites of Passage does not just challenge such preachers-it helps them. Reading this book will fill you with ideas about the structure of homilies, the meaning of the scriptures, and the personal care you can offer families at moments when they need God's word the most. This book is a great find for anyone looking to explore new preaching strategies. As Rites of Passage makes clear, effectively preaching baptisms, weddings and funerals requires that the homilist know well both the Word of God and those to whom he preaches. To preach in a way as to be heard and understood, with particular attention to language and ritual, the homilist must take into consideration both the culture and context of those gathered in any given situation. Authentic evangelization leading to missionary discipleship is always founded on the Good News of Salvation in and through the person of Jesus Christ. I recommend this book to anyone who desires to encounter a renewed sense of Pentecost in better appreciation of preaching as an integral means of the sacramental grace made available in the liturgical rites. When the Word of God is proclaimed at Mass it is not only the recalling of what God did many years ago, it is also an event that is happening at the moment amongst that gathered assembly. How critical it is, therefore, for the preacher to be able to help that particular assembly better understand what the Lord is saying and doing in their midst. This treasure of a book is a wonderfully practical and pastoral resource for preachers to draw on, so as to better help their parishioners to encounter the living God. This is an informative, challenging, encouraging, evocative resource that offers new and experienced preachers many avenues into preaching the homily at liturgical celebrations rich in evangelization potential. The authors exhibit a sensitivity to the integration of biblical and liturgical texts with the human experiences given expression in the rites of Baptism, Marriage, and Funerals. Add it to your homiletics shelf!